'Their garments are white, but with an unearthly whiteness. 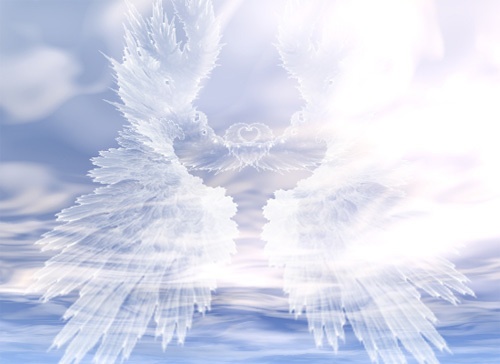 When we call on the angels for guidance we are in a way asking them to light our path for us. These beings have often been described as shining intensly; and traditionally, of course, their haloes of light are their best-known physical attribute after their wings. By seeking to match the angelic qualities inherent in that light, we strive to reflect some of the angel's radiant love into our all to often dark world. Something of the intensity of angelic light has been glimpsed by those who claim to have experienced a Near Death Experience. One of the most common features of an NDE is the incredibly bright white light to which the person concerned is drawn, often along a tunnel. Our own light, even at its brightest, seems dim beside an angel's. Light is not only vitalizing, however: it is also revealing. When we see our imperfections clearly, they become intolerable to us, and prompt us to take healthy, cleansing action. There is a deep serenity to be drawn from meditating on the flickering, steady flame of a candle. However, an equally effective meditation on the theme of angelic light can be performed inwardly, without any external aid as described below. 1. Sit comfortably in a quiet place, and close your eyes. Breathe slowly and deeply, so that your body begins to relex a little. Let the tensions fall away from each part of your body in turn, progressing downwards from your head, down your back, and along your limbs. Try to relax your mind in the same way. 2. Identify a mental focus, just in front of your eyes or forehead - wherever seems natural to you. Then imagine the light of an angel's energy beginning to radiate from this point, like a starbirth. Gradually, you imagine the radiance increasing in strength, without the central point of light, getting any bigger. 3. 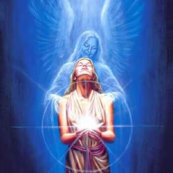 Picture the infinite energy that is pouring out from the angel's heart as a flow that enters your own heart, filling you with divine purpose and strength. After a few minutes of recharging your spiritual batteries, see the light fade gradually, its mission accomplished. Your meditation is complete.